PlantPure Nation Film Tour has begun | J. Morris Hicks, writer. speaker. big picture guy. And they could use your help to maximize its impact. This great new film picks up where Forks Over Knives left off–featuring and promoting the world saving life’s work of Cornell nutritional scientist, Dr. T. Colin Campbell. Directed by Dr. Campbell’s oldest son, Nelson, the national promotion tour began this week. 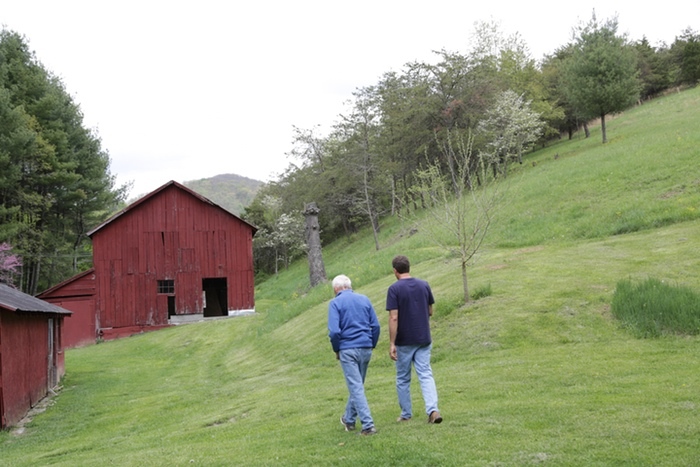 During the film, Colin and Nelson visit the family’s old dairy farm in northern Virginia. The purpose of this blog today is to help the producers of this powerful film reach as many people as possible–and you can help by participating in their Kickstarter campaign and by circulating this blog among people that you know. Click here to visit the Plant Pure Kickstarter page and learn about the prizes you can earn with your pledge of almost any amount. The amazing story told in this film all started in the Kentucky House of Representatives when Dr. Campbell inspired them all with a powerful presentation about how our most feared diseases can be easily tamed by simply helping people learn the complete truth about nutrition. While they were all excited to hear the news at first, many of those politicians changed their tune when they realized how much money was at stake. You can learn how this story ends when you see the movie. Maybe I will see you in New York City on Sunday, May 3 (2 pm at the Chelsea Cinema, 260 W. 23rd Street). Click here to find out when the film will be screened near you. For more information on the film and the national tour, visit the PlantPure Nation website at plantpurenation.com. Last summer, I posted the following blog about the Louisville rally that provided some great footage for the PlantPure Nation film. My 6-21-14 blogpost promoting PlantPure Nation. This entry was posted in Activism & Leadership, Sustainability, Video Included and tagged u. Bookmark the permalink. I will be attending the Long Island screening with my parents on May 4th. Hope they have some good WFPB food options at the Cinema! But I’m not holding my breath.